First of all, I would like to wish Simon the happiest of happy birthdays! May you find happiness in whatever path you choose to take. Your playing career might be over, but you’ll remain my most favorite player forever. All the joy and luck you can handle! I couldn’t miss the once-in-4-years opportunity and post my wishes on the actual date of Simon’s b-day so I turned to this website after over 2 years of absence. Yes, it has been that long. Sadly, the adult-ish way of life (full-time job and such) had me busier and busier until it became practically impossible for me to give this website the attention it deserved. I know this sort of message was long overdue and I apologize for this. I founded SG.com 5 years ago and gave it my best for about 3 years. It wasn’t the biggest hit of the interwebs but it definitely had its great moments, the “Get Well Soon” project (and Simon’s letter of thanks), the time Simon won the Stanley Cup, or when the website was cited and linked to by most (if not all) writers in Philadelphia (that was quite a mayhem that day ) – thanks to this article. It was a wonderful ride. It was difficult and demanding sometimes, but mostly it was great fun and pleasure to be able to bring you news and updates about such a great player and overall amazing guy Simon Gagne is. I will keep the website up and available for browsing simply because I am a sentimental person and can’t just delete it completely. But as you probably guessed, no more updates (unless something insanely important happens). So yes, this is it. I would like to thank all the people who made this website possible – John, Myriam, Audrey, Veronique, and anyone who helped me and supported me in this little endevour of mine. And of course, thank you, dear visitors! Even if it was just one person visiting per day, you made it all worth it. Frank Seravalli of the Daily News was lucky enough to have a word with Simon Gagne who is still jobless, hoping to get a spot on an NHL team nonetheless. Here are some of the most interesting quotes from the article. 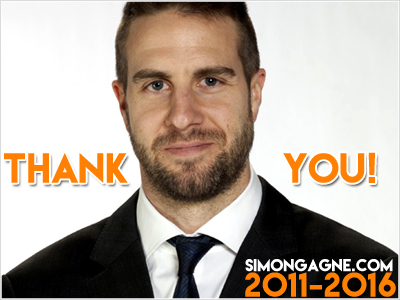 Barely four years ago, Simon Gagné was scoring 34 goals and was considered one of the most talented forwards of the NHL. Today, 33-year-old Gagné is in Quebec City, waiting for a club to give him a chance to return. The Québecker admits that the last few years weren’t easy. He didn’t play more than 63 games in a season since 2009. On the other hand, he participated in 38 of the 48 games last year. Gagné says he found his passion for hockey once again after the trade that sent him from the Los Angeles Kings to the Flyers last February. Gagné collected 8 points in his last 13 games. He rarely played less than 18 minutes each game, sometimes even 20. The 6’1, 194 pounds forward would obviously prefer to have a signed contract in his possession before showing up at a training camp, but he seems ready to show up for tryouts, just like Ryan Whitney, Guillaume Lantendresse and Hal Gill. He wouldn’t say no to the Canadiens. Robert Sauvé says there are frequent discussions with some NHL General Managers about his client. “We talk to teams every day. Right now, the clubs are very interested in their youth, but that can change during the training camp according to their young ones’ performances. Sauvé is more or less surprised to see as many jobless veterans. source: LaPresse; Big thank you to my friend Myriam for the translation from French! (Québec) According to the rumors, Simon Gagné is about to sign a new contract with the Philadelphia Flyers. Careful however, he said that as long as his signature isn’t fresh at the bottom of the document, he wouldn’t announce his official return to the City of Brotherly Love. 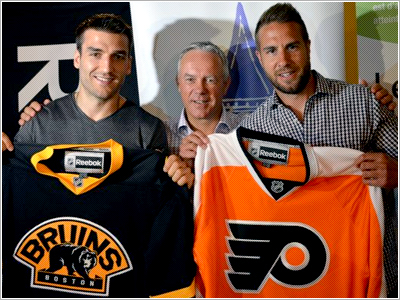 Even if his return to Philadelphia was not confirmed, the Flyers’ jersey was present along with the Bruins’, Tuesday, during the Pro-Am Gagné-Bergeron press conference. It was even announced that that Leucan’s team, where the ex-Remparts would play, was to be named the Flyers. “For now, it’s the jersey Leucan’s team players will wear August 8th. And if there are any changes to be made until then, they will be made. Like I already said, I’m confident that things will wrap up, but if it’s not the case, we’ll wear another jersey”, mentioned Gagné who did not wear the famous orange Jersey in the pictures for the media. source: La Presse; Big thank you to my friend Myriam for the translation from French! (Québec) Simon Gagné should play with the Philadelphia Flyers for at least another year. If it were up to him, his contract would already be signed. But Paul Holmgren, Flyers’ General Manager, is taking his time while other teams show their interest in the Québec-native forward. More than a week after the beginning of the NHL’s Free Agency, the 33-year-old left-wing born in Sainte-Foy currently residing in Lac-Beauport remains unsigned. He waits and lets his manager, Robert Sauvé, handle the situation. “Philadelphia is where I want to play next season. It’s natural for me and my family, on top of it being where I’ve started my career. I’d love to finish it there, but in the hockey world, you don’t always have a choice”, observed Gagné, Friday, during his annual golf tournament for Leucan at the La Faune golf club, in Charlesbourg. Gagné has 13 seasons in the NHL under his belt, 597 points in 799 regular games. The product of the Québec Remparts played his first 10 years in the NHL donning the Flyers’ orange uniform in addition to the last 27 games of the past season. In between, he spent two and a half years with the Tampa Bay Lightning and the Los Angeles Kings. He won his only Stanley Cup with the Kings, in 2012. Hard years nonetheless. He admits having hard feelings for Holmgren for trading him in July 2010, twenty-four hours after his “best playoffs of my career”. Wearing the Lightning jersey made him feel like he was “wearing the wrong jersey. It didn’t work!” His reunion with his ex-teammates from Philadelphia Mike Richards and Jeff Carter, with the Kings, helped him feel less alone. He is also the father of two young children, aged four and two. Since last September, his son was being shifted from daycare to daycare, from Québec during the lockout to Los Angeles when the season started to finish the year in Philadelphia. Daddy is looking for some stability for his young family, and Philadelphia is a familiar territory. The Flyers are choked by the salary cap. Gagné admits being ready to accept less money than what other teams could offer, “to make sacrifices to fit under the salary cap. But I won’t play for nothing. I know my market value”, assured Gagné who says he recieved news from half a dozen other teams, especially from the Western Conference. There were no formal discussions with the Montreal Canadiens. He now works with one-year contracts. He will turn 34 in February and he always thought about retiring around the age of 35 or 36. But hanging up his skates isn’t in his plans for now. He is on the ice once a week with his son and still feels very much at home. “I have the energy, the motivation, and health”, he recaps, smiling.